Hey, do you know what we need? MORE LEGO GAMES! Every time I think the formula is over and done with a new franchise pops up and it still works surprisingly well. 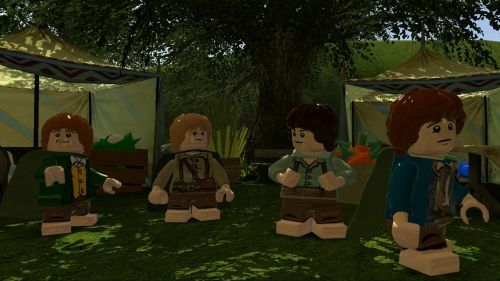 This latest trailer from, you guessed it, Gamescom 2012 features the LEGO The Lord of the Rings game. There's nothing quite like a bunch of maniacally smiling toys to lessen the impact of countless stabbings, slashings, and decapitations. It looks cutesy and fun, which is exactly what I want from a LEGO title. The video features Gandalf's iconic showdown with the Balrog. If you imagine Gandalf trying to curse the beast of shadow and flame with a kidney stone it's actually quite hilarious. Check out the video and try not to wince in pain. LEGO The Lord of the Rings supports two player local co-op. The journey begins on September 25th. It will be available for the Xbox 360, PlayStation 3, and the Wii. Check out our E3 hands-on preview for more information. Page created in 0.3434 seconds.